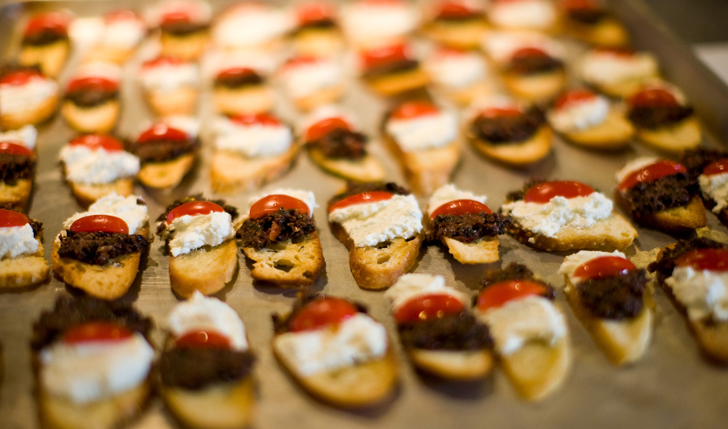 "Bruschetta" (oil rubbed and toasted baguette slices) are great finger foods and a perfect appetizer for a cocktail party or a cocktail hour at a larger celebration. There are many different toppings you can use to make this perfect bite-size appetizer, and we think this combination of olive tapenade and goat cheese is a real winner! Tapenade is a tasty olive spread which takes its name from the Provencal dialect for capers "tapeno". Everyone makes his or her own version, varying the proportions but the basic ingredients seldom change. Basically, bruschetta are very easy to make. Start with several large baguettes and slice the bread on a bit of an angle to make elongated ovals. Brush with olive oil, place on a cookie sheet and lightly toast in the oven until they begin to show a bit of color. Buy your favorite goat cheese, local is always best if you can find it, and let it sit out of the refrigerator for 1/2 hour or so to make sure it's easily spreadable. We use a teaspoon to scoop out a small amount of goat cheese which we rub over about 1/3 of the bruschetta. Then layer a similar amount of tapenade onto the middle third of the bread, making sure to leave the other end free, which makes it easier to pick up neatly. We slice small slivers of cherry or grape tomatoes to use as a garnish on top of the seam where the goat cheese and tapenade meet. Here is the version we serve at Blue Mountain Bistro-to-Go. Coarsely chop everything and put in the food processor. Care must be taken not to over process into mush. Add extra virgin olive oil while pulsing the olive mix. The final product should be well mixed but not pureed. Sun-dried tomatoes, although not traditional, make a welcome addition and add visual interest. Calamata, Nicoise, Gaeta, or a combination of olives all work well together. Oil cured olives may also be used, but can be a bit overpowering if used alone. Green olives are used occasionally, typically with the addition of a few toasted almonds or pine nuts. As in any dish, the freshness of the parsley and/or basil adds a brightness to the flavors and cuts the saltiness of the olives and capers.